Click To Shop Today’s Deal.Low Price, on Amazon, Now! Do you love handling DIY projects at home? Are you looking for the best compound miter saw to add in your workshop? 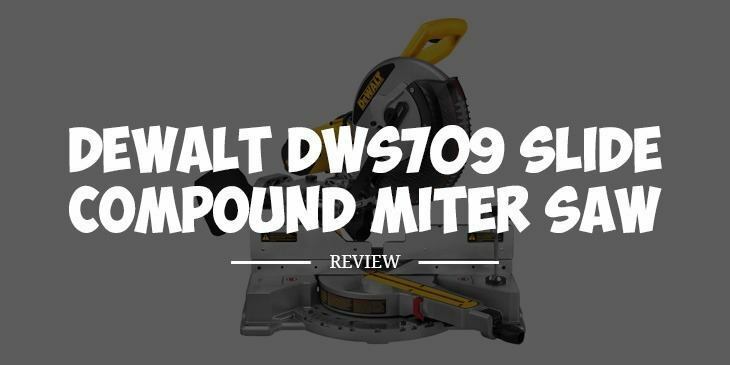 If you want a quality miter saw, read the dewalt dws709 review and you will conquer with me that this is a great tool to have in your workshop. With this tool, you can acquire great performance, power, versatility, and accuracy when cutting any workpiece. The Dewalt brand is among the most highly regarded names in the miter saw niche, and rightly so. The DWS709 is a superb example of why so many people don’t mind the high price.It’s not even the most advanced miter saw in the Dewalt lineup, but for a lot of fans, its features are more than good enough for most woodcutting tasks. Here are some of the features that make this tool an excellent choice. This tool features a 15-amp motor that can get the 12-inch blade spinning at 3800 rpm. Combined with the special back fence design, it’s strong enough to cut straight down at 90 degrees through lumber measuring 2 by 14 inches. At 45 degrees, you can still go through 2 by 10-inch lumber workpieces. The strong motor power assures you of handling both simple and tough projects. It’s not all that bulky, and the weight is quite manageable at 51 pounds. That means it won’t be as much trouble to bring with you to your jobsite. In addition, storage isn’t a big problem either. You don’t need as much space in a cabinet to put it in when you’re not going to use it for a while. Several websites feature the DEWALT DWS709 tool but not all give you the information that you need. Being a tool expert, my joy is when you get accurate cuts when handling different projects, and this is why this dewalt dws709 review is honest. My team and I tested the accuracy level of this tool, and it beats many miter saws on the market today. When you’re making bevel cuts, it’s the same story. The bevel scale is very large, so you won’t make mistakes on setting your bevel adjustments. You also have linear ball bearings and dual horizontal steel rails that help you make very accurate cuts. The DWS709 comes with tall sliding fences, so you can work on 5.5-inch crown molding nested, and on 4.5-inch base molding vertically against the fence. The maximum vertical capacity is 4.5 inches while the maximum horizontal capacity is 9.5 inches. This is one of the features that provide the greatest benefits when using the tool. You can have better reach because of the large blade and sliding head capability. It applies particularly when cutting large pieces wood which would not have been easier when using other miter saws. If you position the tool at 90 degrees you can cut 2 x 14 inches wood. At 45 degrees position, you are able to cut wood that measures at 2 by 10 inches. This Slide Compound Miter Saw has a large sliding back fence which allows you to crown your molding up to a measurement of 5 and a half inches high. It holds your base molding easily to work on items that measure 4 and a half inches high. This feature provides convenience while making bevel cuts since it will slide away easily for you to make accurate cuts. To ensure that the edges are straight and sitting flush, adjust the sliding back fence position then twist to tighten. The Miter Saw has 13 positive stops in the adjustable miter detent plate to improve the productivity of the tool. The stainless steel makes the tool reliable for many years. You can also shift 60 degrees to the right and 50 degrees to the left to enable cutting any wood without flipping the tool around. For greater accuracy and enhanced productivity, you can just set the adjustable stainless steel miter detent plate to any of its 13 available positive stops. These stops are set at the most common miter angles, so you won’t have to set it to the right angle manually each time. Woodworking projects involve the production of dust, debris, and other particles. This is why the tool has a dust bag for easier collection of debris and cleaning of your workplace. You can enjoy a cleaner work environment when the dust is collected in the dust bag. It’s a Dewalt, so you can expect it to work flawlessly for a very long while. The build quality is just superb. In addition, you also have a 3-year limited warranty. This is a dual bevel model so you can tilt the saw to the left or right. It’s actually light for a saw of this caliber. It’s easy to set the bevel and miter angles. The sliding feature lets you cut through 2 by 4’s easily. Boasts 1 5-amp motor power . The miter saw is foldable and sturdy. Provides up to 3800 RPM for 12-inch blade. Able to cut 45 and 90 degrees lumber. Can provide suitable repetitive cuts. You’ll need a compound cut for larger 5.25-inch base molding. You have to upgrade the blade for flooring and molding. Q. What’s the miter angle range? A.It miters 50 degrees to the left, and 60 degrees to the right. Q.What comes with the purchase? A.It includes a 32-tooth carbide blade, a blade wrench, a dust bag, material clamp, and a user’s guide.. If you are a professional, beginner or a hobbyist, you will find it pretty easy to use this tool. The Dewalt dws709 review above gives you with all the information you would love to know before making your final purchase decision. This isn’t the most advanced of the Dewalt miter saws, but its features are more than enough for weekend warrior DIYers. Truth be told, lots of professionals will be happy with the DWS709. It’s easy to use, it’s dependable, the cuts are easy and accurate, and it can last for a long while. You may have to save for it, but you sure do get a lot of value for your money.